Gap and Trap - What Does It Mean? What is a Gap and Trap? 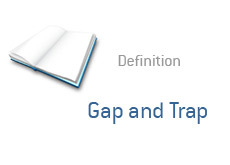 A "gap and trap" can apply to an individual stock, a market index or a futures contract. A "gap and trap" occurs when something gaps up, investors pile in and buy during the first few minutes of the trading day, and then the market or stock suddenly reverses direction, catching the people who bought in right off the open. Let's look at an example to illustrate this concept. Example: A company with the symbol XYZ is positively profiled in Barron's magazine over the weekend. The stock, which closed at $10 the Friday before, gaps up to $11.50 Monday morning. A "gap up" is when a stock opens higher than where it closed the day before - a "gap down" is obviously when it opens lower. Anyways, a number of investors are swept up in the bullishness of the article and set market buy orders on Sunday evening and Monday morning. The stock opens at $11.50. A number of bullish investors buy shares in XYZ right off the open, sending the stock up to $11.80 right off the open. XYZ then quickly reverses direction, and ends up closing the day at $10.30. The investors who bought off the open were "trapped" after the gap higher, and now have significant losses in their positions. That's a "gap and trap". You need to be careful not to succumb to impatience and pay more for a stock than you were planning to. Market makers will "gap" a stock higher in order to trap unsuspecting investors, so please be careful. That's a "gap and trap".